Product #60777 | SKU 996372001 | 0.0 (no ratings yet) Thanks for your rating! 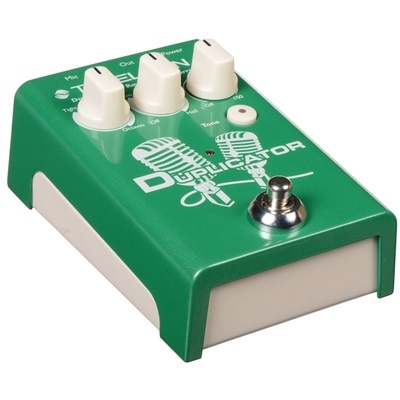 Designed for vocalists, the Duplicator from TC Helicon is a vocal effects pedal in a stompbox enclosure. It provides real-time vocal doubling, allowing you to choose between eight different presets to give the allusion of double-tracked vocals in three overall categories: Tight, Loose, and Octave. The pedal also sports an ambiance section, giving you the choice between room, club, and hall reverbs. Also included is onboard pitch correction to keep your vocals as in-tune as you see fit—you can dial in exactly the amount of pitch correction you require via the knob. A one-touch Tone button handles AEQ, compression, de-essing, and gating, doing so in an automatic and adaptive fashion, and reinforcing a most musical timbre to your voice. The pedal automatically sets your microphone's gain, so that you never need to adjust the levels. Its on/off switch can be controlled remotely via the Sennheiser e 835 FX or TC-Helicon MP-75 microphones. Additionally, this pedal can be powered with four AA batteries or with the optional power adapter.